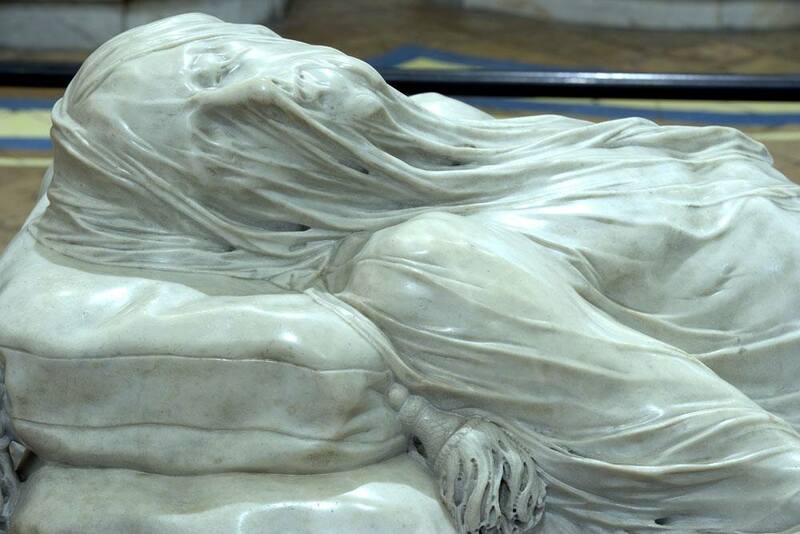 The origins of the Sansevero Chapel are closely connected to a legendary incident. Cesare d’Engenio Caracciolo tells in his Sacred Naples of 1623 that, in around 1590, an innocent man who was being led to prison in chains passed before the garden of the di Sangro palace in Piazza San Domenico Maggiore, and saw a part of the garden wall collapse and an image of the Madonna appear. He promised the Virgin Mary to offer her a silver lamp and a dedication if only his innocence might be recognised. Once released, the man was faithful to his vow. The sacred image thus became a place of pilgrimage and prayer, and many other graces were received there. Shortly afterwards, the Duke of Torremaggiore, Giovan Francesco di Sangro, seriously ill, turned to the Madonna to plead for his recovery. Miraculously cured, he erected in thanksgiving a “small chapel” called Santa Maria della Pietà or Pietatella in the place where the venerable image had first appeared (still visible above the High Altar). 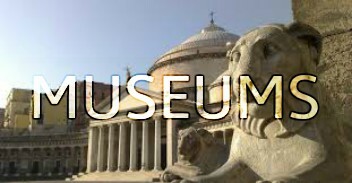 However, it was the son of Giovan Francesco, Alessandro di Sangro, Patriarch of Alexandria, who, in the early years of the seventeenth century began the enormous task transforming and enlarging it, changing the original votive chapel into a true votive mausoleum to house the tombs of his ancestors and future family members. From the seventeenth-century period of the still largely unchanged Sansevero Chapel remain only the outline and the general architecture of the building, together with the polychrome decoration of the apse. There are still four large tombs in the side chapels, while others, which are known to have been there, have been removed. The current layout of the Chapel and almost all the works in it, in fact, were the work of Raimondo di Sangro, seventh Prince of Sansevero, who began reconstructing and reordering the Chapel according to completely new and personal criteria. Although many details of the seventeenth-century family Chapel are now lost to us, it is certain that even then it must have been an artistic treasure-trove. 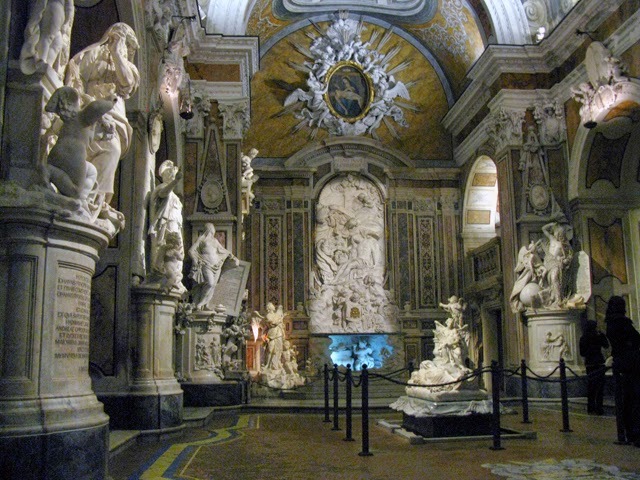 One of the many pieces of evidence to this effect is the Guide to Naples by Pompeo Sarnelli (1685), who defined the di Sangro Chapel as “impressively embellished with works in the finest marble, around which are placed the statues of many worthy members of the family together with their eulogies”. What survives of the seventeenth-century works substantially confirms this impression, even if the magnificence of the eighteenth-century work completely overshadows the works predating Raimondo di Sangro’s patronage. Since the first, then, the Chapel has been surrounded by an aura of legend. The story as told by d’Engenio Caracciolo has certainly been embellished with imaginary details, but it still makes a certain impression. The role Alessandro di Sangro played in the construction of the Sansevero Chapel is further confirmed – not only by various archive accounts – but also by an inscription over the main entrance of the complex, which reads: “Alessandro di Sangro, Patriarch of Alexandria built this temple, dedicated to the Blessed Virgin, as a tomb for himself and for his family in the year of Our Lord 1613”.